In May 2016, Richard Brunning of Southwest Heritage Trust led a team doing the first archaeological dig on the mound since Philip Rahtz’s dig in the 1960s. Richard and his team uncovered the eastern end of the chapels and removed some of the skeletons. 35 of these had been removed by Philip Rahtz in the 1960s and were dated to approximately 700AD, but radiocarbon dating in those days was less exact than it is now, so he wanted some more for more accurate dating and for analysis of the bones, to attempt to determine where the people had come from. ​The skeletons are now dated to the 5th century. This means they are Romano-British, Celtic people. As all the skeletons are male, apart from one female and a child, Mr Brunning said the balance of male and female remains, and the new scientific evidence, meant there was little doubt the burial ground had been a monastic cemetery. It predates Iona Abbey in Scotland, founded in the late 6th Century, and nearby Glastonbury Abbey, which dates from the 7th Century. Brides Mound is one of the less frequented sacred places in Glastonbury. It lies on the outskirts of town at the edge of the former Morland’s site, an old sheepskin factory, that was abandoned for well over twenty years and has now been commercially developed. The Mound plays a significant part in Glastonbury's history and a number of local people have, for a long time, been concerned about its derelict state and felt that a sanctuary should be recreated there. 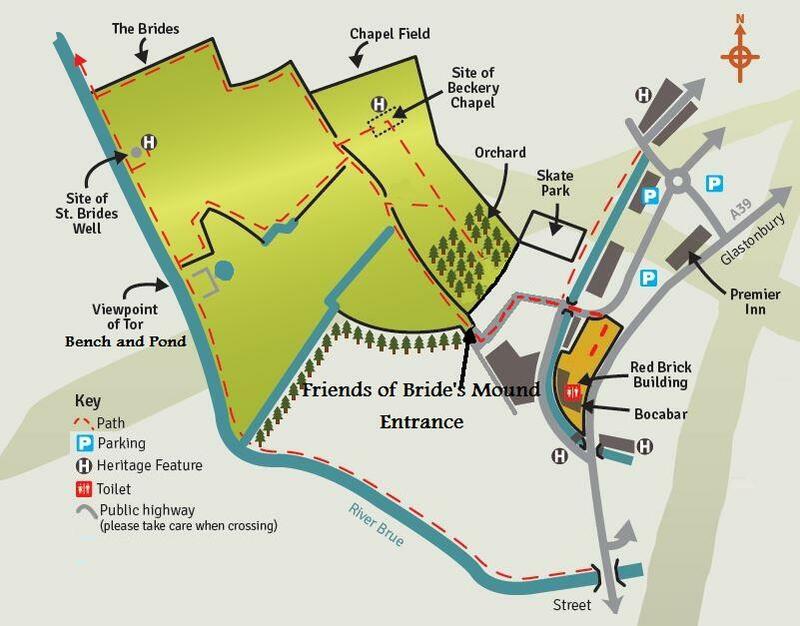 In 1995, spurred on by the threat of development as a part of the Morland's site, a group called the Friends of Bride's Mound was formed. In 2005, three fields, including the Ridgefield lying at the Western end of the Mound, were purchased by the Friends. Bride's Stone. Photo courtesy of the Friends of Bride's Mound. Click to enlarge. The fields to the West of the Mound have been planted with an avenue of trees and two gates have been installed. There is an abundance of wildlife and flora, and a walk to the river takes you to the stone that once marked the site of Bride's Well. The Mound itself is overgrown with brambles and nettles. Footfall has marked paths through to the site of the chapel and it is still possible to connect to the sacred energy of Bride's Mound. Located in an area known as Beckery, a papal charter of 1168 CE refers to it as one of the seven islands in the Abbey's estate, these being Avalon, Beckery, Marchey, Godney, Meare, Panborough and Nyland. In later years it became known locally as Little Ireland due to the many Irish visitors that came here on pilgrimage in honour of St. Brigid. 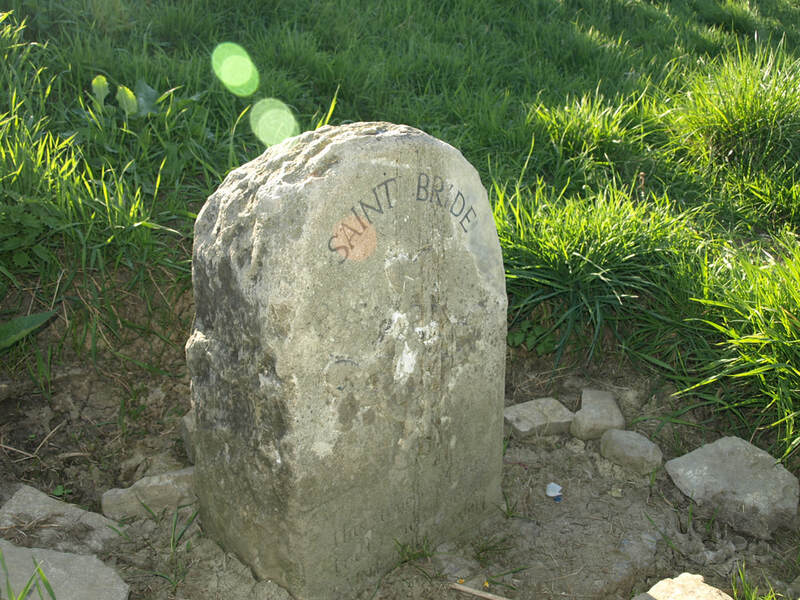 William of Malmesbury, writing circa 1135 CE, and the monk John of Glastonbury, writing circa 1400 CE, both describe traditions of St. Brigid visiting Glastonbury in 488 CE and that she spent time at Bride's Mound. Relics of hers, including a spindle and a bell, are said to have been displayed in the chapel - both writers implying that these were still at Bride's Mound at the time of writing. John of Glastonbury also mentions a chapel at Beckery dedicated to St. Brigid, which had a special opening in the southern wall that healed those who passed through it. Bride's Mound takes its name from Bride (pronounced Breed), Brigit and Brighde (pronounced Bree-dah), the Triple Goddess of the Celts. Bride was one of the most widely worshipped Goddesses in Celtic Britain and is known as the Guardian of Wells and Springs. Furthermore, She has an affinity with Fire and is entitled Keeper of the Flame and Goddess of Fire. The Grail is associated with Her through its link to the Cauldron of Inspiration which was given to the Dagda, father of Bride. Unable to remove such a powerful Deity from the Celtic people, Bride was adapted by the Roman Catholic Church into the cult of St Brigid, who founded a religious community at Kildare in Ireland. According to legend, King Arthur was told in a dream to visit the Mary Magdalene Chapel at Beckery. Whilst doing so, he received a vision of the Virgin Mary, holding the Infant Jesus. She presented Arthur with a crystal cross which he gave to the Abbot of Glastonbury who placed it above the High Altar. This crystal cross is now said to be one of the lost treasures of Glastonbury. The experience led Arthur to adopt a new coat-of-arms, replacing the Pagan Red Dragon with a crystal cross on a green background and an image of the Virgin and Child in the top left hand corner and is said to have contributed to Arthur's conversion to Christianity. 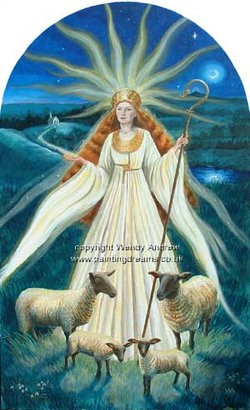 Brigid is a deity who can be seen in many different cultures. She is believed to have been Brigantia in England, Bride in Scotland, and Brigandu in Wales and France. She is thought to be the same Goddess who was worshipped at Bath in ancient Britain as well as the patroness of countless springs and wells in Ireland. Brigid was said to be born in the instance between night and day. As She rose with the sun, a beam of flame was said to have sprung from Her forehead. That She was born on a threshold is a very import aspect of the legend. The ancient Celts were fascinated by in-between places such as shores, the instant of sunrise, the instant of season change, doorways, and other places that lay instantaneously between two places while being in neither. Brigid is the traditional Patroness of Fire, Smith Craft, Poetry and Healing. As a solar deity Her attributes are Light, Inspiration and all Skills associated with Fire. Called 'The Exalted One' or 'The High One', Brigid was known under several names from ancient through modern times. She was perhaps the most widespread, ancient and revered Goddess in Celtic culture. Her connections to Healing also connect Her to Water, as does her Cauldron of Inspiration and many springs and wells bear the name of Brigid. As Goddess of Fire, Keeper of the Flame, Goddess of Smith Craft and Goddess of the Wells, perhaps it is not too great a leap to see Her also as Lady of the Lake and the Forger of Excalibur. Her evolution from Goddess to Saint linked Pagan Celtic and Christian traditions in the same way as the Cauldron of Cerridwen and the Holy Grail were combined in Arthurian legend. She acts as a bridge between the two worlds and has successfully made the transition back to Goddess again with most of Her traditions retained. Brigit, Brid, Brigentis, Brighid (Eriu), Bride (Alba), Bridgit, Brig, Brigantia, Brigentis, Brigantis (Briton), Brighid, Brigidu, Briginda, Brigindo, Brigit, Breo Saighead ('fiery arrowhead'), Brigandu (Gaul), Brigan; Bricta, Brixia, Bricia (Gaul). St. Brigid's life was a remarkable one and the places in Ireland associated with her are scenes of pilgrimage throughout the year. She was born in a society ruled by the old Gaelic Order and the Druidic religion. St. Patrick had already reached Ireland and was in the process of making many changes, but though his message had reached the court of Dubhtach, the powerful Leinster Chieftain held firm to the old religion and the worship of the Goddess Brid. Around 453 CE, a child was born out of wedlock between Dubhtach and one of his Christian slaves named Brocessa. The mother was sold to a Chieftain in Connaught, and the child was given to a Druid to be raised and educated. The child was named Brigid, perhaps to seek the blessing of the Goddess, as from the very beginning there were indications that she was a special child. It was reported that she was born at sunrise, and that the cottage in which she was born burst into flame when she left it. After her fosterage, she returned to her father's house as a slave, although she enjoyed the privileges of family. The stories tell us that she became a vestal virgin in service to the Goddess Brid, and eventually high priestess at Kil Dara (the Temple of the Oak) which gave its name to the present County Kildare. There she and her companions kept a perpetual ritual fire in honour of Brid. The exact circumstances of her conversion to Christianity are unknown. Some claim that she personally met St. Patrick which is possible since she was ten years old before he died but there is no proof of that. Whatever the circumstances, Brigid and her companions in service to Brid, all accepted the Christian faith and formed Ireland's first Christian religious community of women. Legend says that upon her acceptance of her vows, fire appeared above her head. Brigid changed the Pagan sanctuary of Kil Dara into a Christian shrine. She extinguished the ritual fire of the Druids, and lit a flame dedicated to Christ which was thereafter maintained by her followers until it was doused by the forces of Henry VIII. She continued her work until her death in 525 CE, when she was laid to rest in her abbey. In 835 CE, her remains were moved to protect them from Norse invaders and interred in the same grave that holds the remains of St. Patrick and St. Columcille at Downpatrick. and the souls of all we meet. may not pour like cold water on the flame. Bride's Mound can be difficult to locate. Call into the Glastonbury Information Centre for guidance.